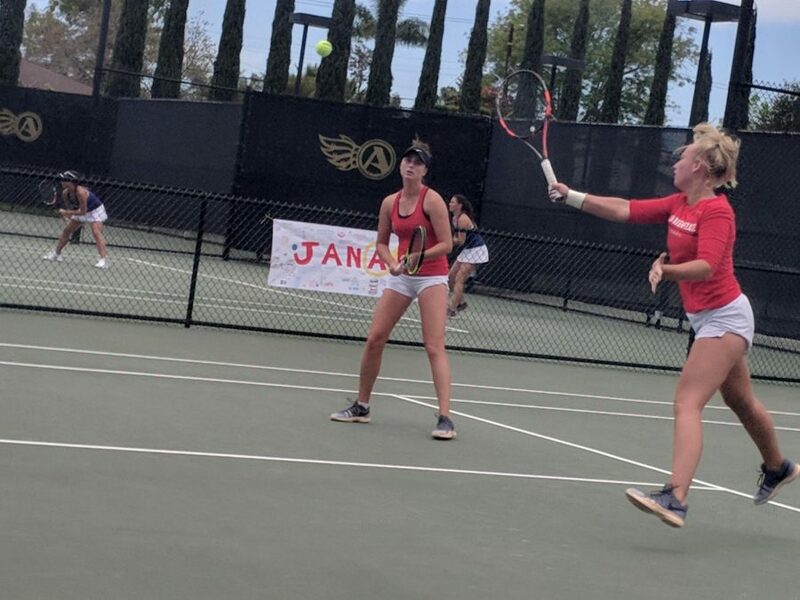 Sophomore Mia Smith (right front) and junior Jenny Moinard compete in doubles during the Aztecs 4-3 loss to San Jose State at the Aztec Tennis Center on April 21. All eyes were on San Diego State women’s tennis junior Jenny Moinard on Saturday afternoon at the Aztec Tennis Center. Moinard was the last player left competing for SDSU during its regular season finale against San Jose State, and a match victory hung in the balance. The Aztecs had already let a 3-2 advantage slip through their fingers, and Moinard would need to come back from a 4-0 deficit in the deciding third set to send her team into the postseason with a win. Moinard fought back to within 4-3 – loudly rejoicing with every point she inched closer – but in the end it was not enough. Moinard fell by a score of 6-4, ending the match – and the regular season – on a sour note. The 4-3 loss dropped SDSU to 10-12 on the season, and improved the Spartans to a record of 12-8. Despite the setback, Aztecs head coach Peter Mattera praised Moinard, who leads the team in singles victories and was riding an eight-match winning streak coming in. The match appeared to be the Aztecs to lose early on, after the team followed it’s 13th doubles point of the season with first set wins in four of their six singles matches. The Spartans roared back from there, winning four singles matches to hand SDSU its fourth home loss of the season. Along with winning the doubles point, SDSU received strong showings from freshman Abbie Mulbarger and junior Magda Aubets, both of whom defeated their Spartan opponent in straight sets. 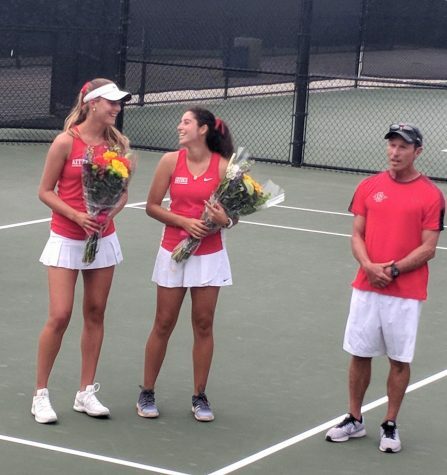 Another bright spot for the Aztecs occurred before the match began, as the team honored seniors Jana Buth and Paolo Diaz in a pre-game ceremony as part of Senior Day. Buth agreed that it was a special day, but said that the final home game of her Aztecs career left her with mixed emotions. “It’s nice, and of course for me it was a weird feeling at the same time too, where I know I’m going to go out for the last time to play a home match,” Buth said. Both seniors lost in their singles matches, but came up big for the team after the pair clinched the doubles point with a come-from-behind 6-4 victory. “(Winning doubles) especially on the last home match it was nice… at least yeah we got the doubles point,” Buth said. Mattera said that it was an emotional day as he prepares to say goodbye to his two seniors. Next up for the Aztecs is the Mountain West Championships, which will be hosted this year by Boise State and will run from April 26-29. SDSU finished the year 1-3 in conference against its Western Division foes, and its upcoming seeding will determine whether or not they will need to win three games in four days or four games in four days. The team will find out their seed on April 22, and Mattera said that the Aztecs will need to be ready for whatever happens, including the possibility of playing a not-so-familiar opponent. One area of potential concern is that SDSU has not won a match away from home this season, something which Mattera said should be a non-issue on a neutral court.